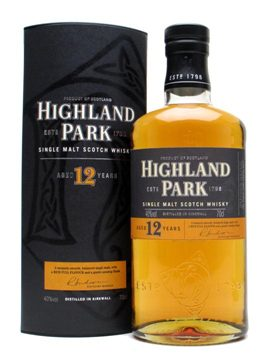 Highland Park is the northernmost whisky distillery in Scotland, located in the Orkney Islands. Founded in 1798 its name does not refer to the Highlands of Scotland but rather to the local area around the distillery. Their 12 year old single malt has been called ‘the greatest all-rounder in the world of malt whisky’. It is one of the few distilleries that still malts its own barley, turning it by hand before smoking it over peat cut from local Hobbistor Moor. The final product, matured in Spanish sherry casks, is gently peated with smoky hints. Golden amber in colour with a sweet nose, in the mouth it is smooth and slightly sweet, giving way to a finish that is long and spicy. Not for nothing has this distillery’s output often been voted highly in international whisky competitions.